The purpose of this system is to recover the hydrocarbon from the drill cuttings from the rig. The feed is fed to the dryer through the feed hopper. The dryer is provided with heavy duty paddles which will churn the material inside. 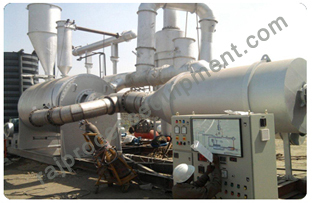 The dryer is provided with external jacket through which hot air generated in hot air generator is passed to heat the material at design temperature. The flue gas coming out from the dryer jacket will be scrubbed with the help of wet scrubber. As the material inside is heated to design temperature the hydrocarbon trapped inside the drill cuttings will evaporate. This vapours generated are passed through the reverse pulse jet type bag filter which will separate fines. The filtered vapours are then passed through the cold water condenser to condense the hydrocarbon vapours. Condensate is collected at the bottom of the condenser. Then the clean air is exhausted to the atmosphere. The condensate stored in receiver and is pumped to the oil water separation unit. The liquid enters the oil-water separator oil and water is separated. 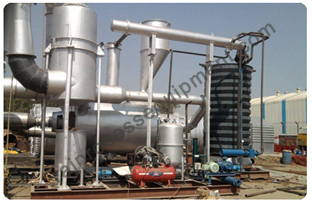 The total system is handled by means of two centrifugal fans. The system is controlled by locally mounted control panel with automation instruments and safety interlocks for safe running of system.